With the release of Rhode Island public schools’ first results on the Common Core–aligned Partnership for Assessment of Readiness for College and Careers (PARCC) tests, the state’s new education commissioner, Ken Wagner, told the Providence Journal that the shock people felt came from the fact that the prior standardized test — the New England Common Assessment Program (NECAP) — had been “masking” districts’ true performance. 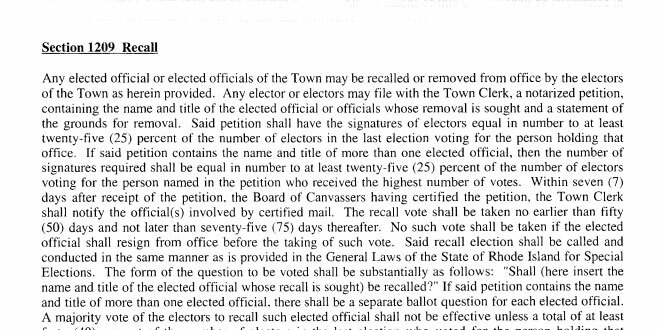 That statement ought to be particularly disconcerting in Tiverton. Although the town’s elementary and middle schools outperformed the statewide average and managed to bring more than half of test takers to the point of meeting or exceeding expectations for their grade levels in English language arts (ELA), the results collapsed in Tiverton High School. 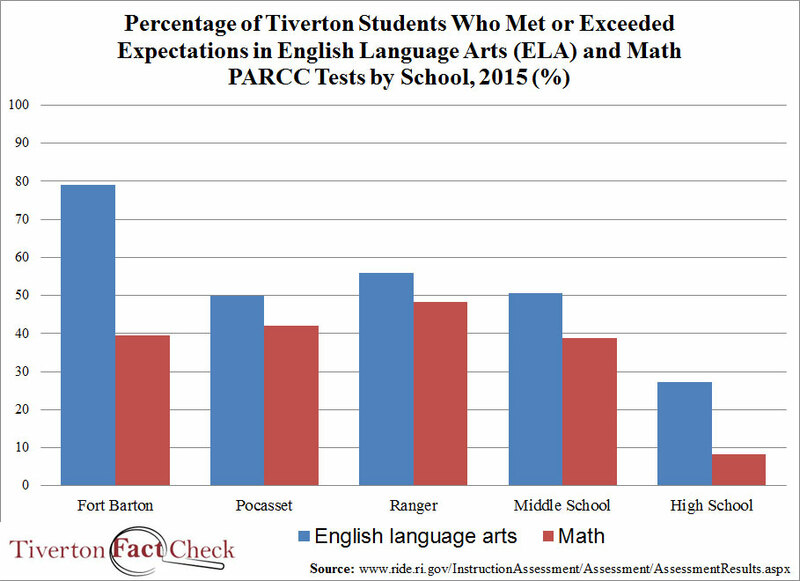 Only 27% of Tiverton’s high-school-level test takers met or exceeded expectations in ELA, and a meager 8% did so in math. 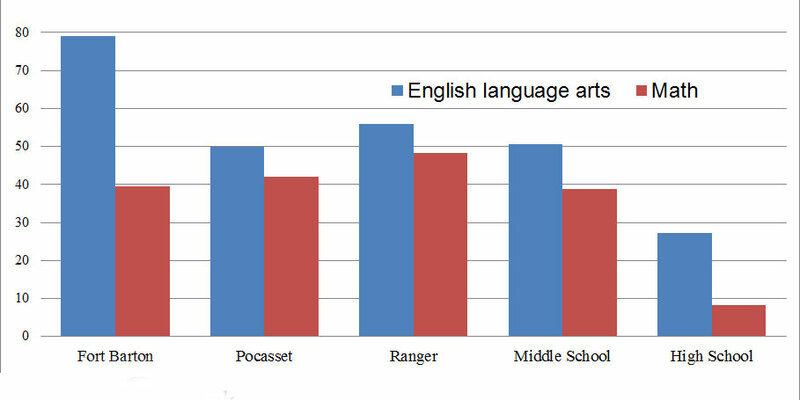 That compares with 54% and 32% in Portsmouth High School and 32% and 12% for the entire state at the high school level. 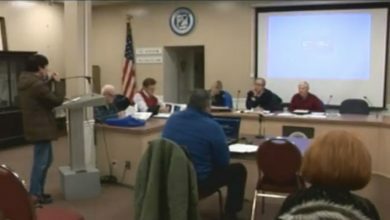 Tiverton schools’ participation rates of 81% in ELA and 80% in math were fourth worst among districts, although Superintendent William Rearick has contested them. If accurate, the low participation could have affected scores if the students who did not take the test were particularly likely to have performed poorly or well. In 2013, the last year that the state administered NECAP tests in reading and math, 82% of Tiverton students achieved marks of “proficient” or better in reading and 68% in math. For the high school, the percentages were 91% and 28%. That year, the state overall had “proficient” or better percentages of 73% and 56% for reading and math, respectively. The Rhode Island Department of Education (RIDE) has also made available an interactive Web page to look at more-detailed demographic results for the state, districts, and schools. For example, Tiverton girls performed significantly better in ELA, 56% versus 40% for boys, as well as in math, with 42% versus 36%. The state’s standardized test isn’t the only indication that Tiverton High School needs some improvement. An interactive chart of high school graduation rates, for example, puts Tiverton’s 87.7% four-year graduation rate at seventh worst among suburban Rhode Island schools. Another six urban schools (district and charter) exceed Tiverton’s results.